The national team, known as Team Melli, is vying for a spot at the 2014 tournament in Brazil. Nobody would pretend that a place at the 2014 World Cup would make Iranians forget about the the current economic hardship in the country due to international sanctions and the isolation that goes along with it, but there are few global events like the World Cup. And there is no sport that Iranians care about as much as soccer. 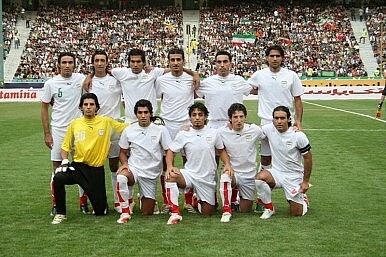 The national team, known as Team Melli by its millions of fans, has appeared on the world stage three times in its history – the 1978, 1998 and 2006 World Cups. Missing out on the 2002 and 2010 tournaments were especially painful experiences not easily forgotten. Fellow “Axis of Evil” member North Korea took the last Asian spot for the 2010 South African tournament. To ensure that players will not sit in front of the television watching the summer 2014 tournament, the Iranian Football Federation (IFF) hired a big-name coach in the shape of Carlos Queiroz in April 2011. The Portuguese tactician not only took his country to the 2010 World Cup, where it thrashed North Korea 7-0 in Cape Town. He has also been the head coach of Real Madrid, possibly the biggest soccer club in the world, and a well-known and important assistant to long-serving Sir Alex Ferguson at Manchester United. It was a statement of intent from the IFF. Queiroz is respected as a serious thinker about the game. The country has the talent, though the 2006 version had the international experience with the legendary Ali Daei and the younger versions of Ali Karimi, Mehdi Mahdavikia, Vahid Hashemian and Javad Nekounam. I interviewed Queiroz recently for ESPN and he talked of some of the consequences of the American-led sanctions – some of which were discussed on The Diplomat in June. "There is a situation with sanctions around the country. For example, when we play abroad, we have problems with visas and it can be sometimes difficult even to get a ticket. Last time we went overseas for a game, two players could not travel as the receptive country would not issue visas for us. When you call young players and, at the last moment, tell them that they can't travel, it is a big disappointment." In the end however, fans care about results and results only. And results are mixed. The team cruised through the third round of qualification, as expected, to make the final round of ten teams in Asia. There, they are split into two groups of five with the top two automatically qualifying for Brazil. After three games, Iran has a full house – a win, a draw and a defeat. It is not quite what was wanted. It started with a good win in Uzbekistan and continued with a frustrating goal-less draw at home to Qatar. A trip to Lebanon, the lowest-ranked team in the group, offered an opportunity to turn that reasonable start into a good one and move level on points with South Korea at the top of the group. Instead, Iran left Beirut with nothing, after a 1-0 defeat. The team has scored just once in 270 minutes of play. Japan and Australia had their World Cup hopes put on hold last night by Jordan and Oman.